The Crazy Bookworm: Speak by Laurie Halse Anderson plus Speak Movie Review! 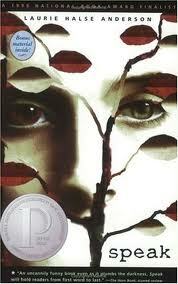 Speak by Laurie Halse Anderson plus Speak Movie Review! My Thoughts: I came across Speak from time to time in the bookstore but never picked it up. Then I started hearing all this hype about it, and then all the articles came out about it being banned. So I finally decided to buy it and read it. I am upset with myself for not picking this book up before, how I wish I read it sooner. Speak is a haunting, painful and beautiful story. The writing style is written in such a way that you feel as if you are right inside Melinda, hearing every thought. Teenage years are the hardest, most confusing of times. We are learning who we are, what we want to do, and how to be comfortable in our skin(which can be made painfully hard at times) When something traumatic happens, it can make those times a million times harder and even more confusing. It alters our perception. You no longer look at the world the same way you once did. The author captured exactly what it's like to be a teenager, not just for the character Melinda but with the rest of the teenage cast as well. The Character Mr.Neck was a teacher that affected me, whenever I was reading a paragraph with him in it, my stomach twisted. I got angry. Bullies don't just live in the bodies of teenagers and young children, bullies also live in the bodies of adults. I'd like to touch on a personal story, when I was in grade 8 I had a big bully. A bully that made everyday humiliating for me. He was my teacher. He was my homeroom teacher and my English teacher. I swear he woke up every morning and thought "What can I do to Cathy today?" On one particular day he called me in front of class and without going into to much detail he humiliated me greatly, to the point where tears were spilling out my eyes. I remember looking around at the classroom and people were embarrassed for me, they wouldn't look at me or my teacher. After a few minutes of this humiliation my class started to stand up for me, a boy I never talked to walked out of class and brought back a box of tissues for me. Another student began arguing with the teacher, they were SPEAKING for me. I'd like to say that it made a difference but unfortunately it did not but those students made a difference to me. My teacher continued to bully me until graduation. Perhaps if I had known about this book then, I would have stood up to him. I would SPEAK LOUDLY, maybe things would have been different. There is one thing I can thank that teacher for and that's for my fuel, every time I set a goal for myself or when I'm writing, I think of him. He always claimed I would amount to nothing and be a nobody so when I accomplish something, no matter how big or small, it's always him that pops in my head. He is my motivation. Anyways that's enough about me...The thought of this book being banned in some places saddens me. This book can help people, with all the teen suicides going on in this world I don't believe it is right to ban something that can save a persons life. This book needs to be praised. Everyone needs to know about SPEAK. If you hadn't read speak, I urge you too. This is a book that should be on the bookshelves of young adults, libraries and most importantly school libraries. Speak may have opened up some old wounds for me but it will help me stand up and speak in the future. This book has no age limit. Before she was Joan Jett, Before she was Bella Swan she was Melinda Sordino. I finished reading Speak then watched the movie right away. Kristen Stewart blew me away as the character Melinda. While I was reading the book I pictured a girl that resembled Kristen. Her performance was incredible, especially the last 10 minutes of the movie. Steve Zahn played Mr.Freeman, a character that I loved in the book and portrayed him wonderfully. He is a very powerful character in the book, and Zahn represented his softness and care for the students perfectly. Robert Burke played Mr.Neck, he played the character just right because everytime he came on the screen I hated it. But that is a compliment. His character was not a likeable one and he kept it the same in the movie. I don't want to give away any spoilers so I am going to end my movie review here, but I strongly recommend watching it, but try to read the book first. There were changes made for the movie but nothing that altered the message and the storyline. The changes were minor. **If you would like to purchase a copy of Speak or the DVD please consider supporting The Crazy Bookworm by purchasing from this link. Thank you! Wow! What an awful teacher!! Arrrgghh, how upsetting!! ~So good of your classmates to support you and glad you came out of it well. --Anyway, I liked the book too. Didn't know there was a movie of this. Wow, what a terrible teacher! Thanks so much for posting this - I had heard a lot about the book but just didn't pick it up. After reading your review, I want to read it. How horrible that you had to deal with a teacher like that. I'm glad you liked the movie. I've really wanted to see it ever since I finished the book. I love Kristen Stewart's movies. I have this book on my shelf, waiting for me to read. I didn't know there was a movie adaption! I definitely want to see it after I read the book.